A. T. Ferrell & Co.
Shoe uses two 10" x 15" screens, one for the top and the other for the lower separation area. Perforated metal or wire cloth screens are available in over 175 different sizes. Optional removable catchall (shown) performs as an air screening receptacle with removable trays. Popular with vegetable and flower growers and in seed stores for specialized cleaning, grading, and sizing. Adjustable slide on the air intake openings provide intermediate air regulation. Accurate, dependable performance for small lot cleaning, testing or sampling. Scalper and sifter screens are standard. Table top design is small, yet accurate. Used in seed plants for sampling large lots. 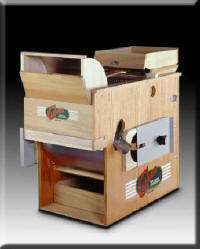 Powerful bottom blast fan driven by a three step pulley. 1. The commodity is fed to the hopper and is spread evenly across the full width of the top screen. 2. The product then moves across the top screen, which has openings larger than the product itself. The large foreign material is "scalped" off while the good product falls through the screen. 3. The bottom screen can either sift or scalp. To set up for sifting, the bottom screen openings must be smaller than the commodity being cleaned. Trash, weed seeds and splits drop through the bottom screen while the good product passes over it. (This is the flow shown in the diagram). When scalping, the screen openings must be larger than the product itself. The large foreign material is "scalped" off while the good product falls through the screen. 4. Next, the product is routed through a column of air from the bottom blast fan. This blast of air effectively removes any lightweight trash and dust that may have remained after screening. 5. Good, clean product is discharged at the bottom of the air chamber into a clean seed box. Clipper Operations Manual - Modern but the concepts apply. 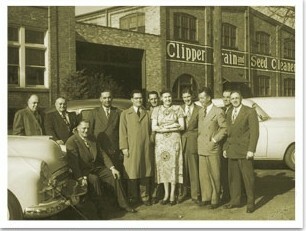 Clipper Seed Cleaners were manufactured by the A. T. Ferrell company. The company still makes and sells agricultural equipment, including seed cleaners. The picture on the right is from 1952.